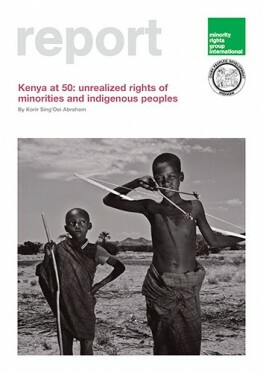 To mark Kenya’s 50th anniversary of self-rule, this report reviews the current status of minority and indigenous groups in Kenya. Focusing on Kenya’s 2010 Constitution, this report pays particular attention to how legal and policy changes over the last five years have addressed the social, economic and political challenges confronting minorities. The present state of minority and indigenous groups within Kenya’s dynamic context has been shaped by conflicting forces of regression and progress responding to the 2007 post-electoral violence, the new Constitution and the forthcoming 2012 elections. This report demonstrates both the opportunities to be seized and constraints to be overcome by minority groups if they are to realize the dream of inclusion. Although Kenya’s new Constitution contains numerous positive provisions for minorities and other vulnerable groups generally, this report shows that the prevailing experience of minorities in Kenya is increased vulnerability. There is a danger that constitutional recognition may not translate into positive developments for minority groups in reality. This report describes the ongoing challenges facing minority and indigenous groups: lack of political participation, discrimination and weak protection of their right to development. Directed at non-governmental organizations, policy actors and the media, this report warns that failure to ensure inclusion of minorities and address the anxieties of majorities, particularly in the context of county governments in the run-up to the 2012 elections and beyond, will lead to untold conflict, driving the reform agenda several years back. To receive MRG’s latest reports by post, subscribe to our publications.